Twenty-nine years ago, HBO had aired a three-part miniseries about the life and travails of a nineteenth century Southern belle named Virginia Tregan. The miniseries was called “LOUISIANA” and it starred Margot Kidder and Ian Charleson. Directed by the late Philippe de Broca, “LOUISIANA” was based upon the “Fausse-Riviere” Trilogy, written by Maurice Denuzière, one of the screenwriters. It told the story of Virginia’s ruthless devotion to her first husband’s Louisiana cotton plantation called Bagatelle . . . and her love for the plantation’s overseer, an Englishman named Clarence Dandridge. The story begins in 1836 in which she returns to her home in Louisiana after spending several years at school in Paris, Unfortunately, Virginia discovers that the Tregan family plantation and most of its holdings have been sold to pay off her father’s debts. Only the manor house remains. Determined to recoup her personal fortune, Virginia manipulates the breakup of the affair between her wealthy godfather, Adrien Damvillier and his mistress, Anne McGregor in order to marry him and become mistress of Bagatelle. Virginia also becomes frustrated in her relationship with Clarence Dandridge, who refuses to embark upon a sexual relationship with her. During their ten-year marriage, Virginia and Adrien conceive three children – Adrien II, Pierre and Julie. Not long after Julie’s birth, Adrien dies during a yellow fever epidemic. Virginia hints to Clarence that she would like to engage in a serious relationship with him. But when he informs her that they would be unable to consummate their relationship, due to an injury he had sustained during a duel, Virginia travels to Paris for a year-long separation. There, she meets her second husband, a French aristocrat named Charles de Vigors. They return to Louisiana and Virginia gives birth to her fourth and final child – Fabian de Vigors. Virginia and Charles eventually divorce due to his jealousy of his wife’s feelings for Clarence and his affairs. Fabian, who feels left out of the Damvillier family circle, accompanies his father back to France. During the next ten to fifteen years, Virginia experiences the death of her three children by Adrien, the Civil War and Reconstruction. The story ended in either the late 1860s or early 1870s with Virginia using a trick up her sleeves to save Bagatelle from a Yankee mercenary, whom she had first encountered on a riverboat over twenty years ago. 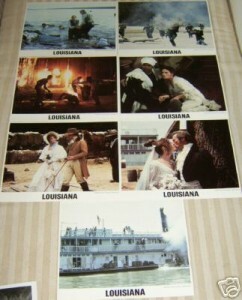 If I must be frank, “LOUISIANA” is not exactly “GONE WITH THE WIND” or “NORTH AND SOUTH” Trilogy. But the 1984 production does bear some resemblance to both the movie and the other miniseries. I noticed that the character of Virginia Tregan Damvillier de Vigors strongly reminded me of Margaret Mitchell’s famous leading lady from “GONE WITH THE WIND”, Scarlett O’Hara. Both characters are strong-willed, ruthless, charming, manipulative, passionate and Southern-born. Both had married at least two or three times. Well, Scarlett acquired three husbands by the end of Mitchell’s tale. In “LOUISIANA”, Virginia married twice and became engaged once to some mercenary who wanted Bagatelle after the war. Both women had fallen in love with a man who was forbidden to them. Unlike Scarlett, Virginia eventually ended up with the man she loved, despite losing three of her children. Apparently, the saga’s original author felt that Virginia had to pay a high price for manipulating her way into a marriage with Adrien Damvillier. “LOUISIANA” also shared a few aspects with another famous Civil War-era saga – namely John Jakes’ “NORTH AND SOUTH” Trilogy. Both sagas were based upon a trilogy of novels that spanned the middle decades of the 19th century – covering the antebellum period, the Civil War and Reconstruction. 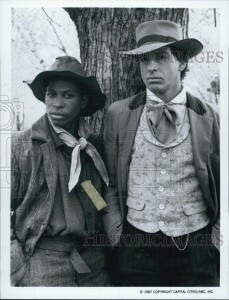 Mind you, “LOUISIANA” lacked the epic-style storytelling of the television adaptation of Jakes’ trilogy. Not even Virginia’s journey to France and her experiences during the outbreak of the Revolution of 1848, along with another journey to France during the first year of the Civil War could really give, “LOUISIANA” the epic sprawl that made the “NORTH AND SOUTH” Trilogy so memorable. 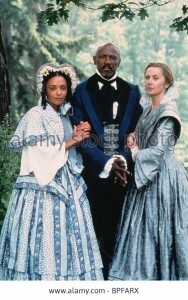 However, the miniseries, like “NORTH AND SOUTH”, did depicted the darker side of the Old South’s plantation system. It did so through the eyes of four characters – Clarence Dandridge; one Bagatell slave named Brent; another Bagatelle slave named Ivy, and Virginia’s French-born servant/companion, Mignette. Like both “NORTH AND SOUTH” and “GONE WITH THE WIND”, “LOUISIANA” suffered from some historical inaccuracies. I found it interesting that Bagatelle did not suffer the consequences from the Panic and Depression of 1837, which lasted until the mid-1840s. Especially since it was a cotton plantation. The economic crisis had not only led to a major recession throughout the United States, it also dealt a severe blow to the country’s Cotton Belt, thanks to a decline in cotton prices. Unlike the 1980 miniseries, “BEULAH LAND”, “LOUISIANA” never dealt with this issue, considering that the story began in 1836. I also found the miniseries’ handling of Revolution of 1848 in France and the California Gold Rush rather questionable, as well. Gold was first discovered by James Marshall in California, in January 1848. But news of the discovery did not reach the East Coast until August-September 1848, via an article in the New York Herald; and France became the first country to fully experience the Revolution of 1848 on February 23, 1848. Yet, according to the screenplay for “LOUISIANA”, Charles de Vigors first learned about the California gold discovery in a newspaper article in mid-June 1848 . . . sometime before France experienced the first wave of the Revolutions of 1848. If there is one aspect of “LOUISIANA” that reigned supreme over both “NORTH AND SOUTH” and “GONE WITH THE WIND” are the costumes designed by John Jay. The costumes lacked the theatrical styles of the John Jakes miniseries and the 1939 Oscar winner. But they did project a more realistic image of the clothes worn during the period between 1830s and 1860s. And fans of“NORTH AND SOUTH” would immediately recognize the plantation and house that served as Bagatelle in “LOUISIANA”. In real life, it is Greenwood Plantation, located in West Feliciana Parish, Louisiana. Aside from serving as Bagatelle, it also stood in as Resolute, the home of the venal Justin LaMotte in the first two miniseries of the “NORTH AND SOUTH” Trilogy. The story for “LOUISIANA” seemed pretty solid. It seemed like a Louisiana version of “GONE WITH THE WIND”, but with the epic sprawl of “NORTH AND SOUTH”. But only in length . . . not in style. Margot Kidder, Ian Charleson, Andréa Ferréol, Len Cariou, Lloyd Bochner, Victor Lanoux, and Hilly Hicks all gave pretty good performances. Kidder and Charleson, surprisingly managed to create a strong screen chemistry. 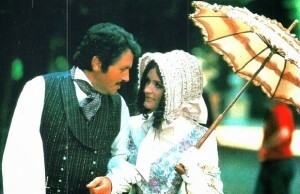 The miniseries indulged in the romance of the Old South. But as I had earlier pointed out, the miniseries also exposed its darker aspects – especially slavery. When the story first began with Virginia’s arrival in Louisiana with her maid, Mignette; the entire production seemed like a reflection of the “moonlight and magnolias” myth of the Old South, until the story shifted to the cotton harvest fête held at Bagatelle. In this scene, slavery reared its ugly head when the plantation’s housekeeper becomes suddenly ill, while serving a guest. 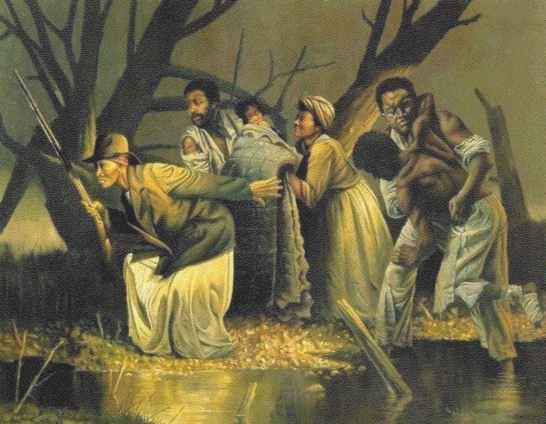 Slavery and racism continued to be explored not only when Virginia’s conservative beliefs over slavery clash with Clarence’s more liberal ideals; but also with scenes featuring encounters between Bagatelle slave Brent and a racist neighbor named Percy Templeton, Mignette’s Underground Railroad activities, and a doomed romance between one of Virginia’s sons and a slave named Ivy. Yet, despite Virginia’s conservative views regarding slavery, the miniseries allowed audiences to sympathize with her through her romantic travails, the tragic deaths of her children and her post-war efforts to save Bagatelle from a slimy con artist-turned-carpetbagger named Oswald. If you are expecting another “GONE WITH THE WIND” or “NORTH AND SOUTH” Trilogy, you will be disappointed. 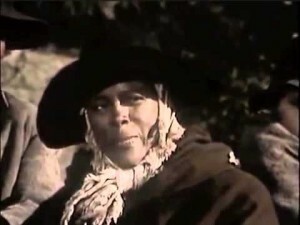 But thanks to Maurice Denuzière’s novels and the screenplay written by Dominique Fabre, Charles E. Israel and Etienne Périer; “LOUISIANA”ended up as an entertaining saga about a woman’s connections with a Louisiana plantation during the early and mid 19th century. For anyone interested in watching “LOUISIANA”, you might find it extremely difficult in finding the entire miniseries (six hours) either on VHS or DVD. And it might be slightly difficult in finding an edited version as well. The last time I had seen“LOUISIANA”, it aired on CINEMAX in the mid-1990s and had been edited to at least three hours. If you find a copy of the entire miniseries or the edited version, you have my congratulations.